You've planned a delicious cake; but what type of wedding cake flowers are you going to decorate it with? 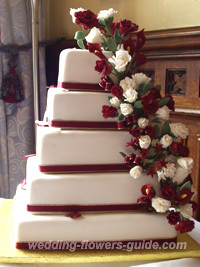 The wedding cake is one of the focal points of the wedding reception. Used wisely, flowers can make a plain cake look spectacular. In the photo below, I decorated a white-iced cake with an arrangement thatincludes a pink rose, freesias, lisianthus and bouvardia buds, together with ivy. One of the first decisions to be made is whether to use real, artificial or edible flowers. Real, Artificial or Edible Wedding Cake Flowers? For some brides there is no substitute for real flowers. They look elegant and can be chosen to complement the flowers in the bride's bouquet. 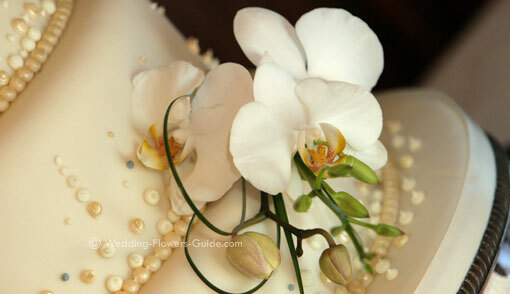 In the photo below you can see how I attached these beautiful orchids onto the top of the wedding cake. The bride had a beautiful phalaenopsis orchid shower bouquet that I created and the table arrangements also featured the same orchids so everything linked beautifully. There are now special holders that are available to florists especially for creating cake decorations. This allows the decorations to be easily moved when it comes to the most important part - eating the cake! Some flowers are poisonous such as foxgloves (Digitalis) and Aconitum. Your florist will know which real flowers are safe to use on the cake. Artificial / silk flowers are a popular alternative. If you are worried that real flowers may affect the cake, these are another option. They can be prepared in advance and given to your cake maker to place on the cake. Edible wedding cake flowers made from icing sugar (photo left) really put the cake makers skills to the test. I've seen incredible roses, alstromeria and calla lilies made from icing sugar. Capturing the color and shape of the flowers is a real skill but can produce absolutely stunning results that are extremely lifelike. There are a number of different flower styles that are commonly used for wedding cakes. Probably the simplest is to create an arrangement that is similar to a corsage or a boutonniere. This can then be placed on the top of the cake. Like the one you can see here, below left. Again I used the same flowers that I used in the bridal bouquet so the theme followed through. This works well for a cake that is covered in smooth white icing. We have made this type of decoration for several brides that were making the cakes themselves. The result is an elegant cake that is not too expensive. Another popular way to use wedding flowers is to have a tiered cake with layers of flowers in between the tiers. This uses a lot more flowers but can produce a visually stunning effect. 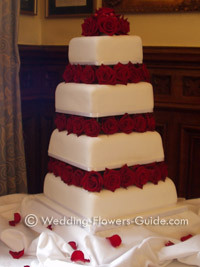 In the photo above right you can see how I have done this with red roses on a large four teired wedding cake. 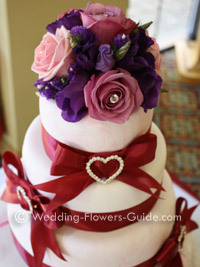 An alternative to placing flowers directly on the cake is to decorate the cake table. This could be something as simple as sprinkling rose petals on the table. Alternatively you could have a small arrangement on the cake table. Low arrangements work particularly well, so that they do not obscure the view of the cake. For the latest ideas on bridal bouquets, centerpieces and arrangements, subscribe to our FREE newsletter here.